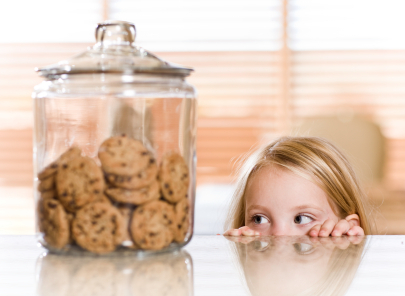 Abiding In His Presence: The "S" Word.....Self Control!! OK....I seriously have a love/hate relationship with this word....SELF CONTROL! I know I'm not the only one who struggles in this area! Another leg of my journey has been to understand how self control plays out in this area of over eating besides the obvious like..."Don't overeat! Don't take that second helping! Don't touch those cookies!!" Self control....love it/hate it....see what I mean? America....Will I go for that second helping or be satisfied with just one...Will I go and exercise or will I choose to do something else????" Day in and day out I am faced with choices that will either help me or hurt me. The good news is that because the Holy Spirit is alive and active within me....the fruit of the Spirit is already there waiting to be used. I love how the Contemporary English Version states Galatians 5:22 "God's Spirit makes us loving, happy, peaceful, patient, kind, good, faithful and self controlled." Colossians 1:9 -12....."9 For this reason, since the day we heard about you, we have not stopped praying for you. We continually ask God to fill you with the knowledge of his will through all the wisdom and understanding that the Spirit gives, 10 so that you may live a life worthy of the Lord and please him in every way: bearing fruit in every good work, growing in the knowledge of God, 11 being strengthened with all power according to his glorious might so that you may have great endurance and patience, 12 and giving joyful thanks to the Father, who has qualified you to share in the inheritance of his holy people in the kingdom of light. N......"no" Ephesians 6:10 " Finally, my brethren, be strong in the Lord and in the power of His might. Put on the whole armor of God, so that you may be able to stand against the wiles of the devil." Putting on the whole armor of God enables us to stand up against the enemy and shout "NO....I will not!" As I look through these verses and take them into consideration as I chew upon the word "self control"....I believe that I can grasp hold of how to implement this "fruit of the Spirit" better into my daily life. All of these words ( spiritual understanding, endurance, life, Father, continually, opportunity, "no", thanksgiving, refrain, opportunity and love) must be in place within my life as I seek to make better decisions. I must have "spiritual understanding" in order to walk and live out God's Word daily. I also need to have the "endurance" to achieve this and not be run over by the enemy's attacks. We can become very weary in the fight against the enemy...and we must look to God and His Word to help sustain us and strengthen us. What is my life, if it is not lived for God? I must keep my eyes on my own life so that I will live a life that is worthy of God and will shine the love of God to those around me. It is very hard to "shine" when I'm exhausted, weary and living in my own strength. I think this next word speaks for itself..."Father" ! 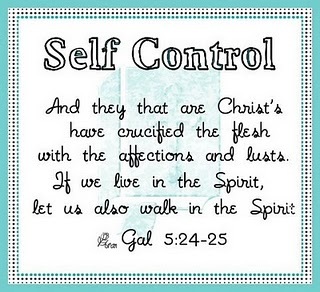 Without a relationship with God through His Son Jesus Christ....self control is temporary and exhibits a "self" motive. Now on to the letters in Control....."continually" is the first one and is the word that Paul uses to tell the Colossians how he is praying for them....continually!! Wow....I have a precious dear friend that is continually praying for me in this journey that I am on. It is so important that we let others know our struggles so that they may lift us up in prayer and support. I will use next two words together..."opportunity" and "no". I will always have numerous opportunities to say "NO" at the enemy, every day! Within moments of me waking up I will have a chance to say no to unwanted thoughts or desires. We live in a fallen world my friends and the daily struggles for self control are abundant. I think the next word is very important to our gaining spiritual strength in this battle ..... "thanksgiving". I have learned to daily offer my gratitude for all that God has done in my life and in the life of my loved ones. I constantly am reminding myself and the enemy about God's great love, mercy and grace for me. We must tell those around us and remind ourselves every day that God desires our praise for who He is and what He has done!! "Refrain" is another for "DON'T DO IT" !! In the particular verse that I chose to go along with this word, it is referring to refraining from anger! I have found in my life that when I give way to uncontrolled anger....it results in my overeating!! I must check my emotions and ask the Lord to show me if my anger is sin or if it is God honoring! Most of the time....it is sin! Self control offers us an "opportunity" to come away from our own selfish desires and turn to others in service. It offers us extra time that would have normally been spent on ourselves and can now be spent on others. "Love" is the last word used and is the greatest of all these words. Our love for God is what motivates us to have self control. Our love of others is what motivates us to tell them what God has done for us and can do for them and our love for eternity is what can help us endure till the end with joy. Courtney...I also love 2 Peter 1 !! Would love to hear any other new insights the Lord gives you in this area! Love Ya Girlfriend! !